Two weeks ago several NiCHE members presented a roundtable at the National Council of Public History Annual Meeting on Making Environmental History Public through Digital Technologies. One of the presenters was on theReturning the Voices to Kouchibouguac National Park project by Professor Ronald Rudin. He also provided an overview of the project here for The Otter, including a preview of one of the interviews. Professeur Rudin a également écrit une version en français pour Qu’est-ce qui se passe. In 1969 the Canadian and New Brunswick governments agreed to create Kouchibouguac National Park along the east coast of the province. At the time, establishment of a national park required removing the people who resided there, in the belief that nature should be exhibited to visitors without signs of any human presence. Over 1200 individuals, 260 families living in seven separate communities, were uprooted, having been told that their lives were worthless and that they could only be helped by being forced to move. While these individuals were far from wealthy, they had built lives that they valued, based upon the resources of the region–the forests, the land, and especially the waters that they fished. The government statistics that led to the conclusion that they were impoverished could not take into account either the fish and farm products that they consumed or the barter that often took place between families. Conveniently written off as worthless, the residents were offered little compensation and sent off to fend for themselves elsewhere. But government officials had not taken into account how this particular case of forced removal would be viewed by the residents, most of whom were Acadians, a people with a strong memory of having been removed once before. This memory of the grand dérangement and the sense that the creation of Kouchibouguac constituted “une deuxième déportation” helped fuel large-scale resistance that resulted in the park being shut down on several occasion. As for the leader of the resistance, Jackie Vautour, he refused to leave his land, remaining there until his house was bulldozed in 1976, only to return two years later, where he remains — a squatter — to this day. Parks Canada drew from its experience at Kouchibouguac that there were better ways of creating new parks, and so the practice of forced removal came to an end. Nevertheless, the Kouchibouguac story remains important for Acadians, whose artists have produced novels, music, poetry, sculpture, paintings, and theatre inspired by this experience of removal and resistance. The story has also been told by way of two documentary films: Kouchibouguac(1979) and Kouchibouguac: L’histoire de Jackie Vautour et des expropriés (2006). Through these various tellings of the Kouchibouguac saga, it became understood as a story of resistance. And the opponents to the creation of the park became symbols of a greater assertiveness among Acadians who were experiencing their own révolution tranquille at the time. However, in this emphasis upon the dramatic conflict between aggrieved residents and government officials, the experience of the vast majority of the expropriés was lost. While the story of resistance was part of what happened at Kouchibouguac, there was also the experience of most families which simply and quietly left their lands to create new lives, often within kilometres of the borders of the park. 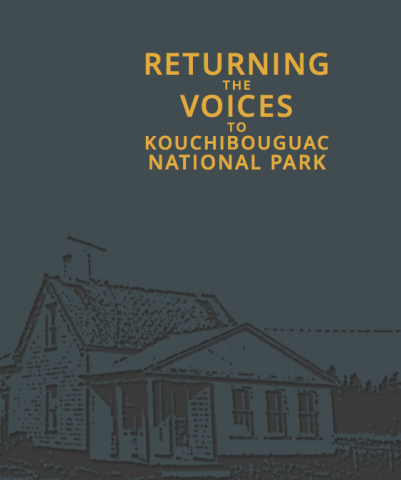 In collaboration with the Montreal-based multimedia producer Philip Lichti, I have developed the website Returning the Voices to Kouchibouguac National Park to tell a wide range of stories inspired by the experiences of the residents. The central feature of the site is the presentation of 26 video portraits drawn from interviews with former residents, who often told their stories while standing on the lands where they once lived, an experience that was not always easy for them. Visitors to the site are encouraged to interact with the map that was created at the time of the expropriation to facilitate the process. Here, however, the map is used as a navigational device to return the voices of the residents to their lands, as visitors are encouraged to click on those properties for which there are stories to be seen and heard. The expropriation map has been superimposed on the current landscape so that visitors can learn about the impact of the park upon both the former residents and the land itself. The website has been designed so as to serve slightly different functions depending upon whether it is viewed on a computer screen, or on a handheld device. In the latter case, since it might be possible for the visitor to see and hear these stories while on the very land being discussed, the mobile version of the website (available at the same URL) provides a link that will bring up a map showing where the visitor is located in relationship to the selected story. The residents who were removed to allow the creation of Kouchibouguac National Park can never return to their lands, but this project makes it possible for some of their voices to return, if only virtually. Ronald Rudin is Trudeau Foundation Fellow and Professor of History at Concordia University.